Introduing the Instant Human mitts! I’ve finally managed to write up the pattern, get it test knit and then set it up on Ravelry! Awesome, isn’t it? I came up with the pattern one day a few years ago while I was doodling around and petting my new yarn. The brown was just so luscious that I had to design something with a coffee theme to it. 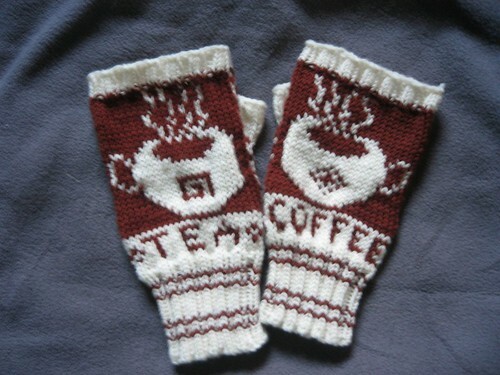 And so after a lot of charting and playing around with gauge, I had the mitts. A fairly quick knit, actually (it helps that I really do love my dpns). Then after awhile, people (and I mean mostly knitters) who saw me wear them prodded me into writing up the pattern. So I did. And then the wonderful Sadie test knit them for me and gave lots of good advice. She got one of her patterns into Knitty so go look!